Some of my tines are almost impossible to tune. Even though they maybe the same length as others they are quite a bit higher in pitch. I can't move the spring far enough down towards the end to get the note low enough. Is this a sign that the tine is dead or corroded in some way? Also what it the optimum length of the tine/position of the tuning spring? I notice you can buy tines cut to length but is this strictly necessary when it will be tuned with the spring? Tines should be cut pretty close to the length shown on the chart. If they are cut too short, that is one possible cause of not being able to tune low enough. In most cases, if you add a second tuning spring to the tines that are too sharp, that should do the trick. I am guessing the tines that you are having trouble with are in the bass. The bass tines use a larger,heavier spring, so you could possibly have the wrong size spring on those tines. Adding another tuning spring will likely be the first easiest solution. The position of the spring(s) will vary from note to note, but you don't want the springs at the strike point of the hammer. Attached is the tine cutting chart that I use. In the version attached below, I only show the new-style tine numbering, and I converted the fractional measurements to decimal inches and millimeters. The fundamental frequencies copied copied from Michigan Tech. If you want the original spreadsheet so you can format and play with it yourself, send me a PM. oops: I think you might not see the attachment unless you log in. Hilariously, the first pdf that I attached was missing key 88. It is fixed now. 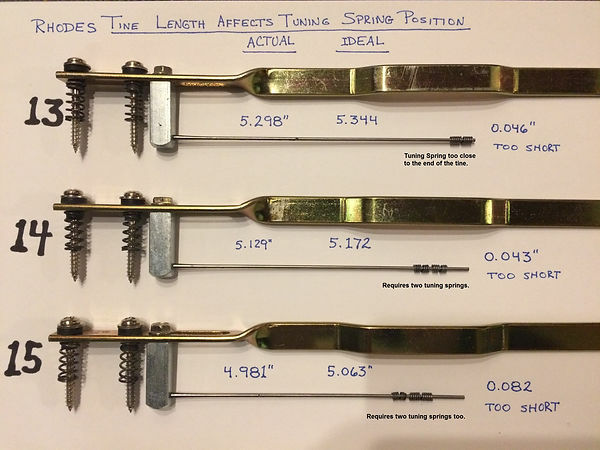 For a given note, the length of the tine affects the position of the tuning spring, the size of the tuning spring required, or the need for more than one tuning spring. If the tine is cut too short, you will either need a large-diameter spring, a longer-length tuning spring, or two tuning springs. 3/16" in the middle, and 1/8" to nothing for the shortest tines. The take-away lesson is don't cut your tines too short. Too long is easier to deal with than too short, and too long can be filed down gradually until perfect.